Finding, curating, and sharing valuable content is a very time-consuming process. Unless you have the right tools to help you out, you’ll lose a lot of time on social media that you could’ve invested in other important work. Content curation is the process of filtering through huge amounts of content from different online outlets to find the best content to share with your social media audience. And it’s something that most of us do. 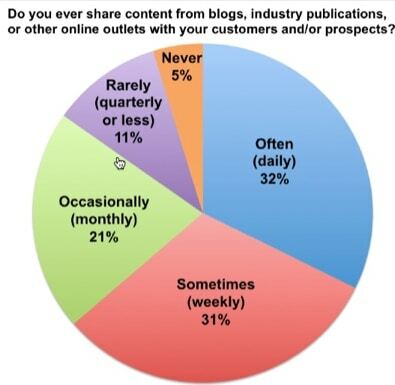 The following chart is taken from a survey conducted by Curata (content curation and content marketing platform), showing how businesses share curated content with their customers and prospects. As you can see, only 5% of those surveyed said that they never share curated content. We all have the need to share content! You know that content curation can help you get more followers and more engagement on social media, but you also know you need to optimize the process in order for it to truly pay off. 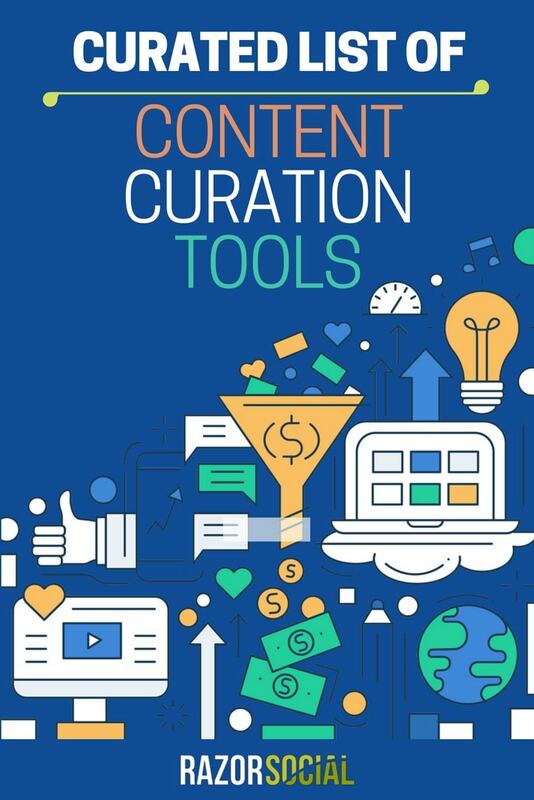 Following are some of the best content curation tools out there that will help you save time and effort finding great content. Note: Make sure also to read the essential effective guide to content sharing. In Scoop.it, you can create boards around specific topics that interest you and then add related content to these boards. 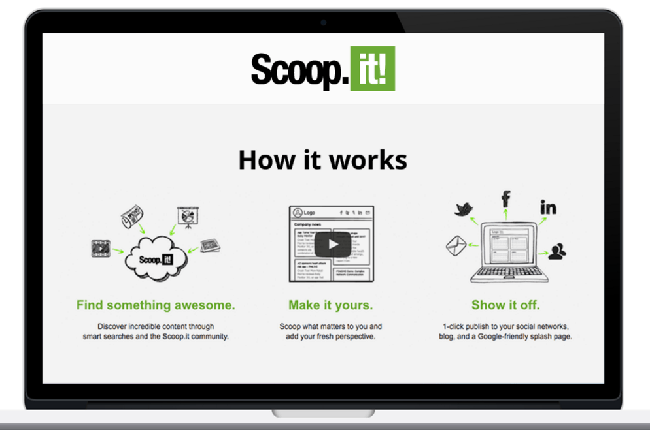 So if you can’t afford to spend a lot of time searching for valuable content, Scoop.it may be the answer you’ve been looking for. Use this curation tool to identify people who add great content to relevant boards and follow them. If you find the right people sharing the right content you’ll save a lot of time. This can be a great source of unique, relevant content to share with your social media audience. Curata is a content curation software that lets you easily discover, organize, and share relevant content for your business. The tool itself is pretty smart – it’s powered by natural language processing technology so it learns your “content taste” over time and delivers the most relevant content automatically. It allows you to filter the content sources, whether it’s blogs, websites or social media sites, and weeds out outdated or duplicated content. There are also great features to help you organize your content as well as options to create your own blog posts from within the tool. For example, you can select content pieces relevant to your business and automatically create and publish a blog post which includes a summary of each of the content pieces you selected. 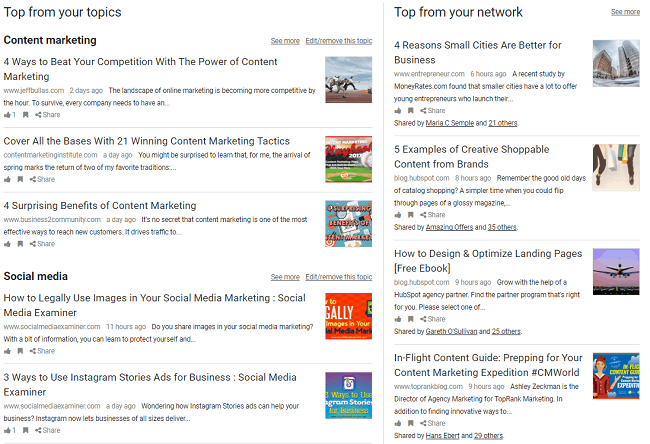 You’re not always going to use curated content for your blog posts, but when you do, this is a very useful tool. Triberr is a community of bloggers that provides an easy way to find and share great content. You join a tribe of bloggers who share high-quality, relevant content and then you can view a stream of their latest blog posts and easily share. When you share their content, you can set a time interval between shares so it’s not all shared out at the same time. Triberr can be a great source of finding fresh content on a daily basis. Even though its marketed as a content marketing automation software, it’s actually one of the best curating tools out there. AndersPink is a relatively new content curation tool that lets you create “briefings” or content streams based on your topics of interest. You can set up your streams based on relevant keywords and use filters to get the latest content from specific sources, including websites, twitter influencers, or RSS feeds. Once created, your Briefings will be automatically refreshed every few hours to include the latest content. If you log in using your Twitter account, your home screen will automatically fill up with the latest content on the topics you share the most on Twitter. Plus, you’ll get to see the latest content from your Twitter network. The great thing about this tool is that you can set your streams up for free. Anders Pink also has iOS and Android apps so you can curate content on the go. If you want a detailed review of this tool, read my article on Using Anders Pink for Content Curation. ContentGems is a content discovery engine packed full of some really powerful features. The tool goes through hundreds of thousands of articles from a variety of online sources to show you the most relevant and up-to-date content. You can configure your preferences to see a stream of content from select sources, and further filter the content by keywords, media, popularity, and more. These advanced filtering options will enable you to find the exact content your audience would like. You can then share that content with your audience across multiple channels, including your social media profiles, your newsletter, blog, website, and even a mobile app if your business has one! This is enabled through integration with platforms, such as Buffer, HootSuite, Feedly, MailChimp, and others. Feedly is an excellent tool for aggregating RSS feeds. You can add content from blogs and websites that are most relevant to your business to create a feed of valuable content. The great thing about Feedly is that you can organize your feeds into relevant categories so you can quickly locate the right content for social sharing. Maybe your Facebook audience responds to certain topics pretty well, same with your Twitter or LinkedIn network. Now you can easily share thematically relevant posts to each of your social accounts directly from the Feedly interface. You can also get a Feedly mobile app, available for both iOS and Android, so you can have your content curation tool with you while on the go. Pocket is a great way to save interesting articles, videos or images you find on the web so you can curate them for social sharing at any time. It’s probably the easiest tool to use on this list – once you sign up and install the Pocket button (browser extension), you’ll be able to save articles from any website with just one click. A nice feature that is useful for your content curation efforts is the ability to tag the content you save to Pocket to keep your lists organized. It also allows you to share links via Buffer, Facebook, Twitter, and Email. With DrumUp, you can find, curate and schedule content for sharing through your Twitter, Facebook or LinkedIn accounts all in one place. The tool has an easy to use dashboard where you can add your social media accounts and set up keywords to specify content topics you want to share. 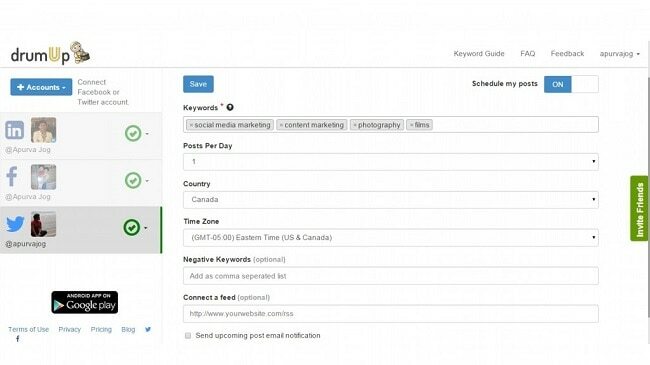 You’ll input keywords, the number of posts per day, as well as negative keywords for each account individually. After you’ve gone through the settings, DrumUp will start pulling in stories that are relevant to the keywords you specified. It’s really that easy. You can now discover relevant content and schedule your social media posts. The tool also lets you add recommended hashtags and @mentions, include images to your posts, set repeat schedules for important posts, and more. With DrumUp app for iOS and Android, you can curate content and schedule posts from your mobile while on the go. Flipboard is a useful app that creates “smart” magazines on topics you choose, and automatically updates them as relevant new content goes live online. Your magazines are smart because the app can learn what kind of content you like based on your reading habits. You can also curate your own magazines. When you see content that interests you, you can easily add it to your own magazine and choose if you want to make it public for everyone to see. You can follow publications and you can share content on Flipboard or outside the app (Twitter, Facebook or by email). A good way of attracting more followers online is to share really good content that is relevant to your target audience. Content curation tools provide the ability to find and share this content. Plus, they can save you a lot of time in the process. So what content curation tools do you use? What tools from the above list would you consider using? You know we love comments. C’mon!! !